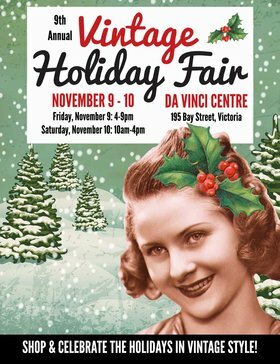 Victoria’s most anticipated holiday fair is back for our 9th year! Shop and celebrate the holidays in vintage style! Yes, find unique, one-of-a-kind gifts for yourself and loved ones! Scoop up charming, vintage holiday decorations and ornaments for you and your home, and have a fun, festive time with our vintage-style entertainment too! We have such an amazing show planned for you, your friends and family! Invite them all! Shop over 40 booths filled with glorious, vintage, retro and antique, one-of-a-kind treasures (including holiday decor, ornaments, clothing, jewelry, housewares, collectibles, oddities, treats and more!) 2 FLOORS!!! We proudly support WIN- Victoria Women In Need Community Cooperative! They've been saving special vintage treasures just for this event! Don't miss their HUGE Vintage Treasure Emporium on the lower level! They have a HUGE TREASURE TROVE of VINTAGE CHRISTMAS decorations this year!!! Don't miss Lucky J's Winter Wonderland Vintage Fashion Show on Friday night, November 9 at 7pm. 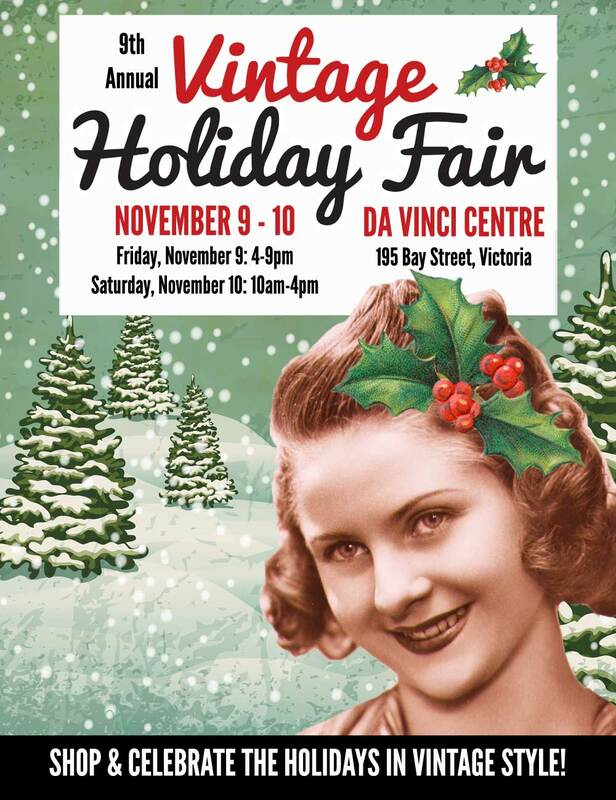 Our local, favourite pin-up models will be decking the halls with their festive, fun vintage outfits! Looking for unique, fun holiday pics this year? We have an amazing, special, vintage-style photo booth for you with Lauren Kief Photography. In addition, enjoy pics with Cornelius the Giant Vintage Parrot (our beloved mascot), Dress Up Contest on Saturday at noon (wear a vintage-style holiday outfit and win fabulous prizes! ), Raffle o' Holiday Delights and much, much more! Free goodie bags for the first 50 attendees when doors open on Friday at 4pm and Saturday at 10am. You'll want to line up early for these goodie bags as they all include a piece of authentic, vintage jewelry, treats and more, all in a handy shopping bag from Used.ca! FREE GIFT FOR ALL ATTENDEES (while supplies last) - get the last button/pin in our series of 4 for 2018! Win amazing prizes from our generous sponsors in our Raffle o' Holiday Delights and our Dress Up Contest on Saturday at noon! Tickets are available cash at the door or in advance on Eventbrite. Plenty of free parking at the Da Vinci Centre, plus easy access via bike and bus. Yummy restaurants and a TD Bank with ATM right across the street for your convenience. Also, new this year, delicious food and treats will be served onsite by Fat Daddy's Catering. Join our Facebook event for exciting updates and last minute surprises! This is going to be sooo much festive fun for you, friends and family! Fun for all ages. See you there!